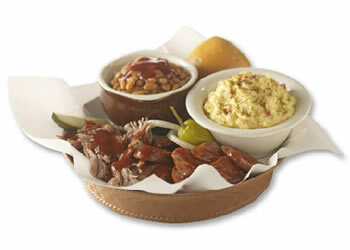 Dickey's Barbecue Pit food, artfully arranged. ﻿ Here's the latest on new restaurants: It’s most likely going to be spring before the second Carl’s Jr., at North Yellowstone and Holmes, opens its doors. Meanwhile, Dickey’s Barbecue Pit, on 17th Street, is taking job applications. On Thursday we called Kelly Grieve, spokeswoman for CKE Restaurants, Inc., to find out if an opening date has been set for Carl’s Jr. Driving by earlier in the day, we noticed the framing was well under way. Grieve said the calendar they keep goes out three months, and the second Idaho Falls location isn’t on it yet. So there you have it, Idaho Falls. Your enthusiasm for chain restaurants is being noted all over the country. Whether it brings Red Lobster, In-n-Out Burger, etc. here any faster remains an open question, but it can't hurt, can it?